Heat olive oil in a large skillet. Cut each chicken breast in half. Season both sides with salt and pepper. Place in the skillet and cook 3-5 minutes over medium heat (or until chicken is golden brown). Turn chicken and repeat on the other side. Add the diced onion to the pan and saute till tender, about 3 minutes. Add the garlic and saute another minute. Stir in the crushed tomatoes. Cook until it starts to bubble, and then turn to medium low/low and simmer for 20 minutes. Stir in the vegetables, sprinkle the chicken with the cheese, and simmer for an additional 5-10 minutes. Remove the chicken, stir the herbs into the sauce, and serve. Whole wheat thin spaghetti topped with a scoop of sauce and a chicken breast half. *Note: I use a mixture of whatever vegetables I have on hand, but red bell pepper, matchstick cut carrot, and zucchini are a good combination. 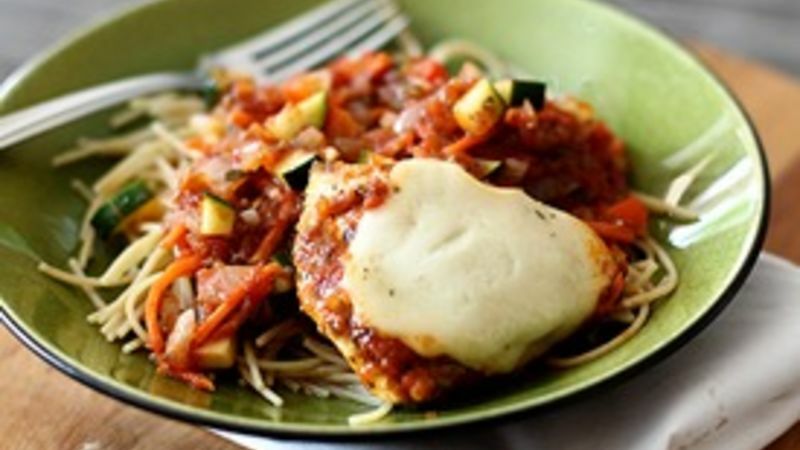 For a vegetarian meal, omit the chicken and serve sprinkled with your choice of cheese. I suggest parmesan or mozzarella. I've been feeling pretty good and on top of things all week because of the Monday holiday. We got a ton done around the house and I whipped out a few recipes and photos for the next couple of weeks. Overall, I'd say it's been a pretty great week...until Thursday. I got the car washed in the morning after kindergarten drop off and somehow the emergency lights got switched on during the interior cleaning. Well, I'm sure you know what's coming...I didn't notice and they were on all.day.long. Come time for the after school pick up and the car is dead. I ended up walking to the school with my 3 year old, and it's not too long of a walk if you plan ahead, but we were already running a bit late. I'll spare you the rest of the details, but if you're a mom you've probably experienced similar afternoons. You're nodding your head and filling in the blanks. No matter how organized you are, this sort of thing just happens. It's called life. And that's when I need a meal plan back-up. Something that I can throw together really easily, that doesn't require crazy ingredients, and is flexible. This Easy Skillet Italian Chicken is perfect for that! Use whatever vegetables you have in your fridge. I like the combination of zucchini, red bell pepper, and matchstick carrots but you can certainly mix things up. Mushrooms and broccoli would be a great addition. Don't have chicken? It's flexible! It will just be a vegetarian night instead. There isn't a lot of clean up because you cook the chicken, vegetables and sauce all in one pan. So, two pans total if you make pasta...or maybe only one if you have leftover pasta in the fridge.